As the number of vegans increases, the industry and consumers are having to quickly learn how best to cater to the diet. Sonia Sharma finds out more about what both need to know about getting the proper amount of protein from vegan food. There are an estimated 600,000 vegans and approximately two million vegetarians in Britain, with figures from The Vegan Society showing that the number of vegans doubled from 0.25% in 2014 to 1.16% in 2018. To cater to this increase of changing dietary requirements, the industry is offering various solutions. We spoke to Louise Palmer-Masterton of plant-based restaurant Stem + Glory to find out more. Sonia Sharma: How can vegans mix and match amino acids to ensure they get the full spectrum of proteins? Louise Palmer-Masterton: The essential amino acids are histidine, isoleucine, leucine, lysine, methionine, phenylalanine, threonine, tryptophan and valine. Grains are lacking in lysine, beans are high in lysine, therefore combining these two foods gives a perfect amino acid balance. Grains and legumes are complementary proteins. Nuts and seeds together with legumes are also complementary proteins. So, let’s hear it for hummus! This vegan staple is a complete protein – chickpea (legume) + tahini (sesame seed). But what many people do not realise is that you don’t actually need to eat your full spectrum of amino acids at the same meal. The liver can store essential amino acids, so as long as you eat a varied, plant-based diet that regularly includes all the aminos, you’ll be getting everything you need. SS: What foods work well together to create complete proteins? LPM: Some plant sources are actually already complete proteins – soy, quinoa, chia, hemp and amaranth – but rather than focus on just those, it is far better simply to eat a combination of vegetables and plant proteins. As well as hummus, other full spectrum amino food pairing tips include: One pot dishes that include grains and legumes together; salads with beans, nuts and seeds; nut butter sandwiches on wholegrain bread; tofu or tempeh and vegetables with nuts (with or without brown rice, buckwheat, whole-wheat noodles or quinoa); and vegan yoghurt with nuts or seeds. SS: What are some of the most common vegan myths that you have seen/heard? The strongest and largest of our animals on this planet are 100% herbivores. Civilization has been reliant upon herbivores, by way of horses and oxen which have great strength and stamina for work, for thousands of years. They get enough protein from plants – and so can we. 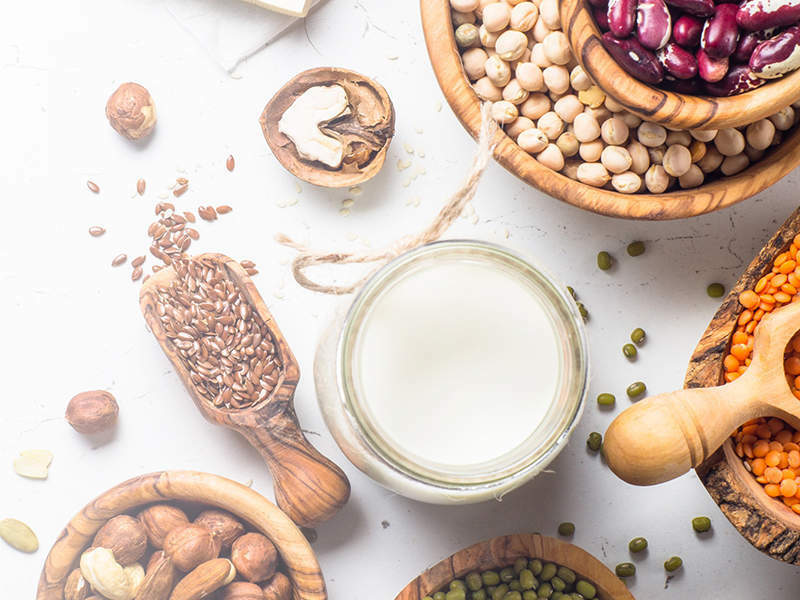 The truth is, everything we eat has a protein element to it and as long as your plant-based diet is varied, it will contain all the protein you need, including the full spectrum of amino acids. SS: Why can vegans often end up eating more protein than the average meat-eater? LPM: We don’t need as much protein as you might think (men should get 56 grams and women 46 grams daily). Most people eat almost double this, which is actually detrimental to health. Your average pork chop contains approximately 20g of protein. This is exactly the same amount of protein as 1/2 cup tofu, or 1 cup cooked beans. Add your tofu or beans to vegetables, a sprinkling of seeds or nuts and you’ll be up to more than 30g – over half your RDA. In fact, it is actually easy for vegans to eat more than their RDA of protein without even trying. In the course of trying to ‘get enough protein’ many vegans are actually getting more than they need.